For our client related practice module we have been given a mini brief of sorts to work on. This is to develop any element in consultation of the rabbit Exo-Suit design from Paul and Gareth’s game Rabbit Heart until we get an outside client. I’m pretty familiar with the game as we had a brief in a previous year to design HUD’s for Ululu (Main Character) and the Exo-Suit. As the brief is quite open ended and we to some extent have free rein over what we do I was unsure what element I wanted to focus on. Initially I was thinking about creating an environment either the cave area in which the Exo-Suit is stored and initially found or a laboratory in which the scientists would experiment. I was more interested in doing the latter but there isn’t much imagery or details on what a laboratory would look like so would be difficult to create. Instead I have decided against doing an environment and actually focus on the Exo-Suit, Initially I want to explore how it would be in combat for example what weapons it has, how it uses them, is ammo needed, shields, abilities etc. I’ll do this through research and inputting my own ideas and then posting what mechanics I think would work well. But the main part of what I want to do is to model the full Exo-Suit or just parts of it depending on time, I plan to do it high poly if I have time to improve my own modelling skills. If I do manage to complete the full Exo-Suit I would like to look into how to rig a character to create some animations for it but again this all depends on if I have the time. Explore how the suit would perform in combat and what mechanics it could have (design weapons?). Model the Rabbit Exo-Suit (or parts of it). Rig and animate some movements. 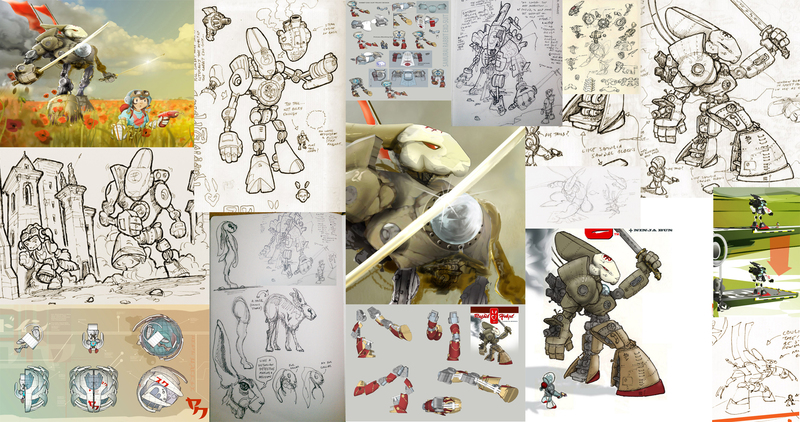 I’ve started by going through the Rabbit Heart blog reading some of it and collecting all the concept art and images of the Exo-Suit I could find, I created the collage below so I could easily view them all..
I’ve saved all the original images so I can look at them in more detail if need be. From here I’m going to research some games with Mech Suits in them looking at combat, movement and their designs, off the top of my head I’m thinking Transformers, Iron Man, Gundam Series, Armoured Core Series and Titanfall. This will give me a better understanding of how they work in other games and hopefully give me some inspiration. ← Naughty Dog Q&A Session..